Aomori Osorezan Stout is a 5% English stout from Aomori Ji-Beer, based in Aomori, Japan. Like the rest of the range of Osorezan beers from them, Aomori Osorezan Stout is brewed using locally sourced water from Mt. Osore and was also the first microbrew from a temple in Japan. It undergoes secondary fermentation in the bottle and is deemed a happoshu beer as it is brewed from only 91% malt with the other 9% being from barley according to the Aomori Ji-Beer website. At the time of writing, Aomori Osorezan Stout can be found in bottles only. 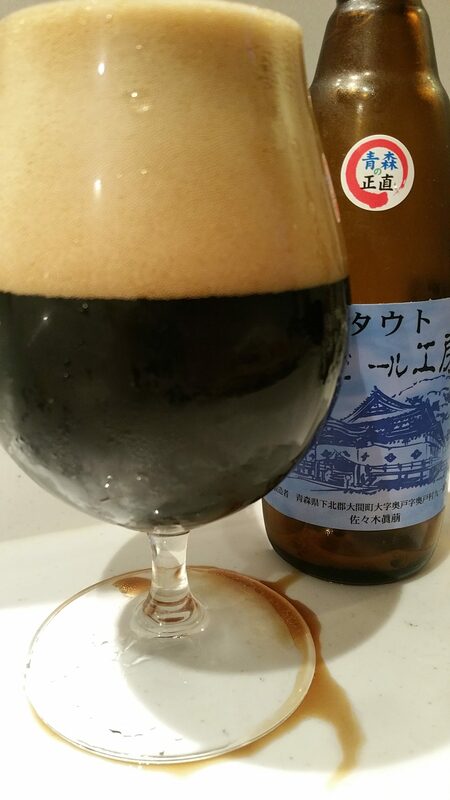 Please excuse the picture above – Aomori Osorezan Stout exploded out of the bottle when the lift-up lid was pulled and this was all I managed to capture of the beer before it was washed away. It wasn’t as bad as the pocket bomb Oatmeal Stout. What beer I managed to save appeared to be pitch black with a slightly tan-coloured head and also had a peculiar liquorice and aniseed aroma, though those aromas were so dominating over the meagre hints of coffee and chocolate that were there too. I really have had no luck with the Aomori Ji-Beer’s though with Aomori Osorezan Stout, there was some semblance of a drinkable beer going on – it wasn’t much mind but there was some typical stout flavours of roasted coffee and chocolate. However, and this is a massive however, the liquorice and aniseed flavours dominated over everything, beating the taste buds into submission. Those flavours lingered well on into the night, spoiling the lager I had after – don’t worry – it was just a Kirin. Another stinker from Aomori Osorezan Stout that could be better if they took the time to review how they make beer.